The What: Peerless-AV has launched a new line of vertical lift carts (SR584VL2, SR584VL3). 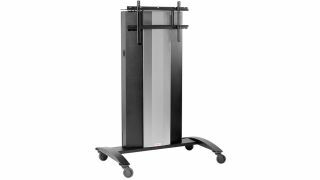 Designed for corporate and education settings, the ADA-compliant, UL rated carts quickly adjust the height of interactive displays with the touch of a finger. The What Else: In lieu of purchasing multiple displays for multiple rooms, schools and businesses can now order one display and create a mobile solution that is used in numerous classrooms and conference rooms upon need, saving time and money. The carts’ highly mobile solution uses 4 inch lockable casters, corner bumpers to prevent damage to walls and doors, integrated handles to help maneuver the cart, and an extension cord wrap for fast deployment. Other features include height adjustment up to 15.75 inches (400mm) with the touch of a finger; lockable rear enclosure for storage of a PC, power supply, and cabling; capacity to add an external Wi-Fi antenna; accommodation for displays ranging from 90.2 to 209 pounds; and UL rating for safety assurance, passing tip, load, and drag testing. For huddle rooms or conference rooms dedicated to collaboration, Peerless-AV also offers a line of vertical lift wall mounts (SF684VL2, SF684VL3). The Bottom Line: ADA compliance is a crucial consideration when deploying interactive displays in education and corporate environments. Meeting the ADA Standards for Accessible Design, Section 308, Peerless-AV’s new vertical lift carts allow users to raise or lower a display to their preferred height or for wheelchair accessibility.